Montana has had a continuous Amish presence since 1974. The state’s 5 communities range from the oldest at Rexford (Lincoln County) in the state’s mountainous northwest corner, to Rosebud County in the eastern Plains. Amish first settled in Montana in 1903, though that pioneer community has since ceased to exist. The current group of Montana Amish settlements includes 4 communities founded in the last fifteen years. Rexford, Lincoln County (West Kootenai)-The West Kootenai area, lying a few miles from Canada, is home to the oldest Montana Amish settlement. Rexford holds a yearly school auction in late spring. St. Ignatius, Lake County-The single-congregation St. Ignatius community also features an annual school auction. Other Montana settlements-Small Amish communities are also found in Jefferson, Fergus, and Rosebud Counties. The oldest Montana Amish community is found near the town of Rexford in Lincoln County. Amish first settled here in 1974. Despite its age, the community is small, at just a single congregation. The area is commonly known and referred to as West Kootenai. The West Kootenai community, lying a stone’s throw from the Canadian border, is known for its impressive vistas and scenic mountain views. Amish from Eastern settlements traveling in the West are known to stop and visit at Rexford among other communities. The Rexford area is home to the annual West Kootenai Amish Community Auction, which helps to fund the local Amish school. The auction is held on the second Saturday in June each year. The 2011 event will be held Saturday, June 11th, beginning at 9 am. The location is 250 Whitetail Dr, Rexford, MT 59930. Items sold at the auciton include log furniture, cedar furniture, machinery, log cabins, gazebos, wall hangings, wood carvings, handcrafted items, and hand-stitched quilts. Quilts are made by local Amish as well as by Amish from other settlements around the country. Amish provide lunch at the event, which includes barbecued chicken, pie, ice cream, and baked goods. For the 2011 auction, quilts, wall hangings, and other items begin to be sold at 10:30 am, with log homes and machinery going up on the block starting at 12 noon. Amish from Rexford achieved a degree of publishing fame with the 1988 release of a cookbook entitled Amish Country Cooking by the Amish of the West Kootenai, Rexford, Montana. This guide to Plain cuisine was one of the first books translated into the Japanese language, in response to signficant Eastern interest in the Amish people (“Japanese Interest in the Amish”, David Luthy, Family Life, Dec 1997). Amish at West Kootenai/Rexford also produce log and rustic style furniture (read more about Amish furniture in Montana). The Amish community at St. Ignatius in Lake County lies within a 3-hour drive of the Rexford community. The St. Ignatius group began settling the area in 1997, and like Rexford, is a single congregation in size today. Also like the Rexford Amish, the St. Ignatius group holds a well-attended auction. The Mission Valley Annual Amish Community Auction is held annually on the weekend after the July 4th weekend. The 2011 event kicks off at 9:30 am, Saturday July 9th. 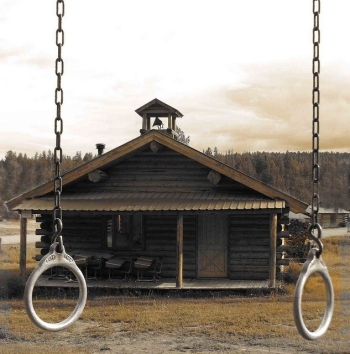 The location is the local Amish school, at 13137 Foothills Road, St. Ignatius, MT 59865. A listing of the items up for sale includes: quilts, furniture, log cabins, crafts, machinery, sheds and mini-barns, children’s playhouses, lawn furniture, log furniture, and a number of other items. The quilt portion of the auction begins at 11 am. Lunch is provided by the Amish, with a menu including barbecued chicken, cole slaw, potatoes and gravy, rolls, ice cream, and pie. Like the Rexford Amish auction, a portion of the proceeds from the Lake County auction is used to benefit the Amish school. Three other Amish settlements are found in Montana. In the same year as the founding of the St. Ignatius community, another group of Amish settled in Rosebud County in eastern Montana, near the towns of Ashland and Forsyth.The Jefferson County settlement, near Whitehall, was founded in 2001. Montana’s youngest settlement (founded 2008) is located in Fergus County, near the towns of Moore and Lewistown. All of these settlements are a single church district in size. The Libby community emerged from a horse-and-buggy Amish background, comprised of members who previously lived in the West Kootenai settlement. The Libby group maintains ties with similarly-minded communities in Bonners Ferry, Idaho, and others in Eastern states including Pennsylvania. 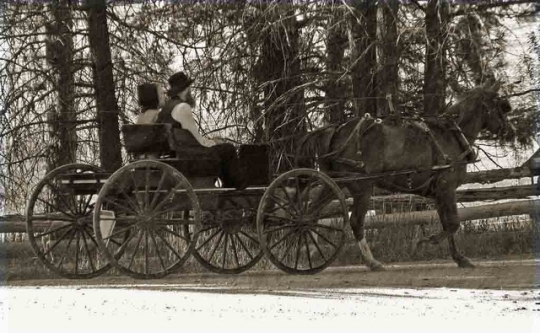 Though they have experienced a shift away from the Old Order including a change in theological emphasis and the adoption of vehicles, they maintain some cultural similarities with horse-and-buggy Amish churches. 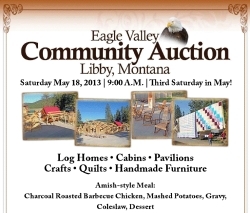 The Libby community holds an annual auction known as the Eagle Valley Community Auction, occurring every third Saturday in May. The 2014 edition will be held on Saturday, May 17, 2014. Items for sale in previous editions have included log homes and cabins, pavilions, quilts, crafts and handmade furniture. The auction takes consignments and has booths available for vendors. The auction benefits the community’s school. Quilts, furniture, crafts and other items can be donated to this end. The contact number for donations is (406) 293-8707. The Amish-style meal served includes charcoal-roasted barbecue chicken, mashed potatoes, gravy, coleslaw, and dessert. The address for the auction is 50 Meadowlark Lane, Libby, MT 59923. 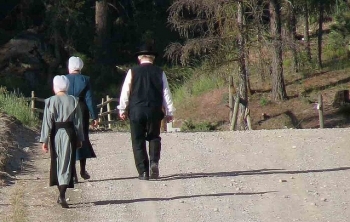 Relatively few Amish have settled in Montana. In the state’s history a handful of Amish communities have come and gone. One community existed in the state in the early-to-mid 1900s, in Dawson County. Historian David Luthy explains that Amish from North Dakota came to the area of the future town of Bloomfield, lured by inexpensive land sold by the railroad, as well as free plots offered through the Homestead Act. Over the years, other Amish joined them from communities such as Garnett, Kansas, Nappanee, Indiana, Dover, Delaware, Salinas, California, Fayette County, Illinois, and Coleman, Michigan (The Amish in America: Settlements that Failed 1840-1960, pp. 261-266). 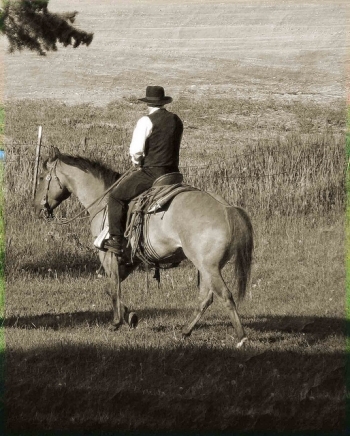 The community was isolated, with the nearest trading post a thirty-mile ride by wagon. An unusual situation arose at Dawson County, with one of the Amishmen handling postal duties for the fledgling community beginning in 1906. The post office was soon relocated to a larger town, however. David Luthy notes that “Less than three years later it no longer existed, bringing to an end a rarity in Amish history–the occupation of postmaster” (Settlements that Failed, p. 264). Amish in Dawson County raised wheat, oats, alfalfa, flax and barley. They also mined free coal from the abundant veins in the region. The settlement had a resident minister for nearly all of its existence, but eventually failed. One reason for its failure was the drying up of free land. With most available homesteads claimed, the enticement of land was no longer there to draw settlers to the remote region. The Dawson County community ceased to exist in 1935 (Settlements that Failed, pp. 264-267). The Dawson County community is not the only extinct Amish settlement. 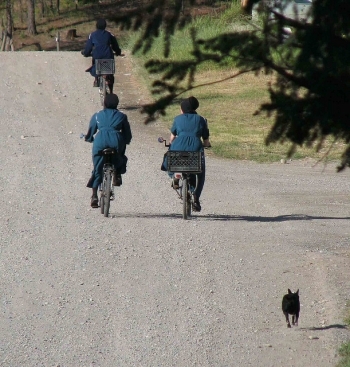 During the 1990s and 2000s, at least two more Montana Amish communities came and went. The community at Libby, in Lincoln County, was founded in 1992, going extinct in 2004. Another short-lived settlement was found at Gold Creek from 2004-2006 (Amish Settlements Across America: 2008, David Luthy). Outside of their original homeland of Pennsylvania, Amish have also settled heavily in the Midwestern corn belt. But with rising land prices in these traditional areas, a number of Amish have headed West. Amish interest in the West is not new, however. Pioneer Amish attempted to settle in Western states in earlier eras. In addition to the Dawson County settlement described above, the late 1800s and early 1900s saw Amish forming new communities in California, Arizona, and Oregon, among others. In the present day, Montana, like Colorado, South Dakota, and other states, has attracted Amish with an adventurous spirit and willingness to travel in search of greener pastures. With the price of land remaining an important factor, it will be interesting to see if the current trend for Western settlement holds. Love these pictures! Did you take them? I like the Amish lifestyle, and I would like to move to and live with and like the Amish. Can anybody help me with finding family’s who will help us get settled in an Amish community in either Idaho or Montana? Thank you very much, I will impatiently await a response. I am a widow, and I take care of my widowed mother. Interesting, since I live in Montana myself. The communities in Gold Creek and Libby which you say are extinct are actually still very intact, although they switched from horse and buggy to vehicles, and aren’t considered Amish anymore. Also, the Amish from Whitehall and Ashland have all relocated to other communities either within Montana or some other state. To my knowledge only 3 communities of Amish exist in Montana anymore. St. Ignatius now has 2 church districts instead of one like was stated. They are considered New Order Amish. Horse back riding among the Amish not common?? In Montana they do it more often then what they use their buggys. One has to be adventurous to be Amish and live in Montana at the same time! In response to Mary’s comment on May 2011 regarding the Ashland Amish, the community is still here and growing. They have a store, a trading post opened December 2012, and several new houses have been built. They are located on the Tongue River Road North of Ashland just past where the pavement ends … look for the signs. There is an Amish community in Lewistown now. We lived with the amish community in Libby for 7 years and then left from there. They are no longer amish there, altho some of them still dress that way. And yes there are still amish in Ashland as far as I know. So someone is amish because they look like one,we in Libby are amish in culture, that is our heritage, not because we look like amish. My dad’s maternal grandmother was Zelma Emma Yoder. Daughter of Rufus,son of Steven,son of Stephan from Thun… wondered if we’re related. Love the pictures and the stories. I actually lived in Dawson County, MT for a brief while. 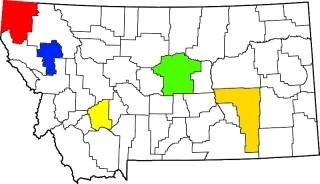 Dawson county is know for the “Montana Bad Lands”. I lived in a town called Glendive. There is a state park there called “Makoshika”. It is in a sense the opening to the bad lands. Out beyond the town are grain fields and a little further south and west of Glendive a lot of beets are grown. It is a beautiful area. I can certainly understand anyone wanting to live there and would even consider going back myself one day. I never knew there had been Amish in that area but did know of the Amish in the western part of the state. This has been quite interesting, thanks for posting it!! Hi Beth, they’re nice, aren’t they? No these are all James Anderson’s photos (see the credit at the bottom). I thought they were great as well. Thanks again to James for sharing. Mary that is correct, from what I know. But for the purposes of these guides they are extinct as Old Order Amish. If you search on Youtube you can find an interesting revival video with the Libby group, done in the last few years, I believe. Still wearing Plain clothing and beards. That is interesting about the Whitehall move and the St. Ignatius group dividing to 2 districts. That all must have occurred in the last few months (or, they didn’t get their info in to Raber’s in time). I had the impression that they might ride horses more in Montana, but that would definitely make them a bit different than your typical Amish. Western style, I guess. Or adventurous as you say! And Alice, that is neat. Apparently Glendive was the town that the first Amish settler stopped in to spend the night on the way to founding the Dawson County community. He met a land agent there who took him to see the land they eventually settled on. I have visited the Amish in Rexford and found that to be the all time prettiest Amish settlement. I felt sorry for the Rexford Amish as they are far enough north and a high enough elevation that they have difficulty raising garden produce. In addition every Amishman that travels west stops into visit them draining the already limited resources (they are close to the White Fish train depot). They appear to have developed special skills in logging with horses and building log cabins. Kootenai Lake close to the settlement has some of the best freshwater salmon fishing in the state and they often go on fishing trips. One of the original founders of the area John Miller was drawn to the area because of the fishing. He first learned of trout fishing while in CPS in South Dakota. St. Ignatius works better for growing produce and dairy farming and my impression is that the Amish their are able to live a more traditional Amish life. Where can I find the Amish in Rexford? We spent quite some time looking for them last week but came up empty. Lowell super to hear from someone else that knows these communities firsthand. I found it interesting what you said about every western-traveling Amishman stopping in at the Rexford Amish settlement. I had understood that they get a lot of visitors, and your comment makes me wonder how they feel about it. Probably nice on the one hand to have so many different folks coming to see you way out West, but on the other, “draining resources” as you said. After a visit to Glendive last week, I returned home to Missoula through Lewistown. Traffic at Eddie’s Corner was slow and then I saw it – an Amish horse and buggy! It was the first time I was aware the Amish had settled in Fergus County. I stop at the Amish run General Store every time I go through St. Ignatius. Gives me opportunity to buy Sweet Lebanon Balogna and enquire about the possibility of Shoefly Pie. My husband and I were in a Walmart store in Great Falls, Montana and we saw so many women dressed like the Amish we’ve seen in PA but their head scarfs were black with white polka-dots. What is the significance of these such scarfs? Is this a local community of Amish? There is a large Hutterite colony near Great Falls. They follow the teachings of Jacob Hutter. Unlike Old Order Amish, they use many modern conveniences. I think you were observing Hutterite women. They look Amish but often will wear plaids and polka dots. They are a number of large groups in that part of the state. Very interesting Anabaptist group who live communally. I think Eric has featured them in the past. I was in St. Ignatius recently and also stopped at the Mission store with their Amish good. Bought some wonderful Black Raspberry Jam. I understand some of the Amish there lease land on the Blackfeet Indian reservation. It is possible that the Amish lease land on the Flathead Indian Reservation but they would not have a preference over tribal members. Im personally acquainted with most of the amish that live in St. Ignatius and they own their land like everyone else who is not tribal. Since the Dawes Act of 1887, which allowed homesteading on reservations, their has been private land ownership in the area. We are looking for Amish to build a horse barn for our draft horses in the Drummond, Montana area. We would like 4-6 stalls on both sides of the barn with 10 foot overhangs, and a 16 foot breezeway down the center. Stalls would be 12′ x 12′. Do you know of any Amish communities that would like to do this? Trina if your still looking for a horse barn look up Miller Storage barns in the St. Ignatius area. They are Amish and have years of experience. They are known to build exactly what you would like and stand behind it with a satisfaction guarantee. Their number is (406)745-3207. I would also second the comment about seeing the women dressed up in Great Falls. They were most likely Hutterites from the local communities found in that part of the state. Also an update on the St. ignatius community they are as of last year two congregations. The recent increase of families to the community called for a split to accommodate all the members in the area. If you would like to see some of the businesses in the St. Ignatius Amish community these are a few of their websites. I am wondering what the closest community to Sheridan or Buffalo ,Wyoming would be.I am in the process of planning a vacation for June or July. I would love to attend a craft,fair ,farmers market or flea market or community .Thank you! The St. Ignatius community has their annual amish auction July 7th and it is about 3hrs closer than the Rexford community. This is a website that gives more details. Ashland would be the closes community to Sheridan … about 2 hour drive. They have their annual Amish Auction on June 8th this year in case you want to attend. This might not be the closest Amish community to Sheridan or Buffalo, but there is an annual Amish Auction that happens in June every year in Rexford, Montana. It happens every year for years already and attracts hundreds of people. You may look it up online to when exactly the date is. (I think its usually the second Saturday of June. )Besides attending an interesting and unusual auction, you would also be driving through the most beautiful part of the Montana Rockies! I’ve been interested in the Amish for a very long time now. I beleive they have a right in the way they do and belief in things as the rest of use do. I have been wanting to visit an Amish settlement. Like the one in Penn. state. But u all know, its hard to save the money to be able to go do something like that. When I found tonight that there is a settlement there in Montana (with me living in the Magic Valley of Idaho), it makes me even more wantig to be able to visit a Amish settlement. I know its closer and everything. That makes it hard, knowing how much I want to go there to visit, buy a real actuall Amish quilt (maybe buying a few other things as well), ride in a buggy for a few moments, and meet some of the Amish, I would be really happy. Being able to achieve one of my dreams. I know it sounds real corny. But, for the ones who dont understand, its like wanting something really bad. For the ones who actually do live in, near, around settlements like the Amish, you probably dont know what your missing. Maybe one day I could go visit. But for now, I at least can dream what it would be like to visit. I know I would LOVE to have an Amish quilt and any thing else that they make that I may be iterested in! Any contact info for the Gold Creek Amish Mennonites? I’m trying to contact the former Amish in Gold Creek, who are reputed to be excellent craftsmen and workers. I think the name is Hochsteder? Anyone have that info? Donald, one person you could check with is John Hochstetler, Hochstetler Custom Kitchens, 406-288-2298 in Gold Creek, Montana. Many thanks. I’ll do that. We have an immediate opening for a ranch hand/wrangler position on our ranch that we would like to offer to the Montana Amish Communities. We are searching for a specific contact to the Montana Community, or a means to place our ad for this position before them. Please advise? Thank you. Where in Montana are you located? We are located in the Kalispell region. If you happen to know of anyone who might be a contact for passing along this opportunity for a job as a wrangler/ranch hand to the Amish Community, please let me know. Glad to see an informative website on MT Amish. After stopping by the St Ignatius store yesterday I looked on the web and found a website for the St. Ignatius Amish community that sounded like an evangelical Christian site. While at the store I had a chance to chat with the individual at the register who invited me to attend Sunday services. I was somewhat surprised as I understand the Amish as not seeking English visitors. I’d like sometime to be able to unobtrusively listen to the service and hear the hymns, some of which are available on CD’s. Is it possible that this congregation is drifting somewhat from the Amish tradition as described in Hoestedler? As noted on this site other Montana Amish have ceased being traditional Amish. Outside the store I observed one of the Baptist Ten Commandments billboards which adorn the Flathead Valley. The gentleman with whom I spoke was occupied with working and that, combined with my reticence to ask personal questions kept me from finding out more. I did, however, get to practice dialect German. I am interested in American religous history from a sociological perspectie, rather than, say, that of a participant-observer. The Amish and Mennonites are particularly interesting to me as one branch of my grandmother’s family (Ludy) were German-speaking anabaptists who came to North America in the 18th Century. Thank you for providing an opportunity tolearn about Montana Amish.. I never knew we had colonies in MT. First time I saw any were yesterday. There were 3 ladies and a little tiny girl. I was standing looking at what I wanted to puchase and the little girl tugged on my dress. She wanted me to say “HI” to her. Have to love little kids, so cute. If you ever come back here to The West Kootenai again you would be welcome at my house! We live less then a mile from the store. Amish restaurants near Ronan or St Ignatius? We’re going to the National Bison Range this month and we’ve heard about a wonderful Amish restaurant nearby, but I’ve looked and can’t find any information. Does anyone know of it? Can you tell me where the Bison Ranch is located? I know of an Amish restaurant in MT. but don’t know whether its close to the Bison Ranch. There used to be an Amish restaurant in St. Ignatius but I understand the family that ran it moved to central America. You could check with one of the Amish families in St Ignatius. Oh yes, we have gone past the bison ranch many times on our way to Missouli but I had forgotten where it was. If its worth going there each summer, (like you do) then we should stop in ourselves some time! The restaurant I was referring to is in Rexford. In fact, its located in The West Kootenai to be exact. Probably 150 miles from St. Ignatius. Helen, I’m not aware of an Amish restaurant near the Bison Range but there is a Mennonite Restaurant in Ronan called the Ronan Cafe. They make wonderful bread and pies and serve breakfast and lunch. It’s right on Main Street in downtown Ronan. BTW The Bison Range was beautiful last weekend (except for the smoke, of course.) We saw lots of muledeer, whitetail deer, pronghorns, partridges and raptors. We didn’t see elk or bear, but a photographer said we’d passed close to six bears, eight feet up in the trees over the berry bushes! We got to see a couple old bull bison up close since they weren’t with the herd, and we saw lots of bison from a distance. This is such a beautiful time of the year in Montana. Helen, The Amish-owned Mission General Store in St. Ignatius sells deli sandwiches, phone 406-745-7200. Ronan Cafe is run by Holdeman Mennonites, also known as Church of God in Christ, Mennonite. Holdeman Mennonites, also known as Church of God in Christ, Mennonite. Thank you for mentioning the Holdeman Mennonites. I’d read about this branch of the anabaptists previously but did not see the (obvious) connection to the St Ignatius congregation untill you pointed it out. Oh, and the sandwiches are very good, and certainly worth stopping in for. i live in palmer, alaska, and for several years now have been watching the boreal forest stress, most likely because of the ozone hole. for every 1% decrease in ozone, there is a 2% increase in uv light. there is so much now that our trees on the farm are dying, and we will sell next year and move farther south. the cfc’s which destroy it are still being manufactured and take 50 yrs to migrate to the stratoshere, where they act as a catalyst in destroying ozone, which means one molecule of cfc, does its damage over and over and over. if the entire boreal forest dies, the carbon in the atmoshere will double to 800 ppm or so. we do not even have a quality of life now, we have to walk away from our farm, 450 trees, and climate sci. say a 2-3 degree is the max. so, in the very near future, much sooner than anyone ever suspected we may all be living, like the amish. that is where i will place my family anyway. near an amish community with as little city folk as possible. if anyone wanted to see the boreal forest dying, get on a plane and fly to anchorage before the leaves drop. the birch are mostly brown with crispy edges. its the beginning of the end for our planet as we know it, and human civilization with it. Looking for Amish family who moved from Maquota Iowa to Ashland area approx. 7 years ago. Which Ashland family are you looking for? We live close and could relay a message for you. I would say Old Order. Do you know how many families are there? My husband and I were trying to figure out an answer to your question on how many families were currently in the Ashland, MT community – we can think of about 20 family units of the ones we know, but there are some on the West side (in the foothills) that we have not met yet and there are constantly visitors from back East that stay for long periods of time (hard to tell if they are staying or not … until they are gone or a new home goes up). Hope this answers your question. That answered my question Thank you Mary. Are there many places to rent for an older person near the Amish Communities? I love the Amish & their dedication to God, Family & Community. I have been thinking of relocating. I have lived in Washington State all my life. Ashland is a very small community and the Amish community is about 5 miles North of town. There are some vacant homes in Ashland but none that I know of in the Amish community unless you are one of the communities family members or are from another Amish community. There is a retirement apartment complex on the hill overlooking town but I do not know much about it. If you need information on it let me know. Does anyone know if any of the Amish Community in White Hall, MT build sheds such as Loafing Sheds for horses? I just moved from York, PA and would always go to Lancaster PA to the Amish there for everything building and everything for driving horses. I need a Loafting shed 10 X 16 or 12 X 16 on skids or sled to be portable to be built. Is there a shop that I could go drive to and speak to an Amish Shed Builder in Montana, near East Helena, MT? You can get ahold of them ( Hochstetlers) at 406-288-7654 – just tell them that Viola gave you their number. There is also a big Amish Auction at the West Kootenai every year on the second Sat in June where you can buy loads of rustic furniture. This is pretty timely — I’m heading up in August to begin to get my poor little neglected Deer Lodge house fixed up. I’d heard of the Gold Creek Amish folks, so will keep them as a resource. I see you said in this post that you have a place in Deer Lodge. We will be visiting NW Montana in late September and Deer Lodge is a possible side trip. We love Amish, having visited them in 4 different states. Also, we are interested in visiting the historic ranch there. We would love to come visit you and your colony!! A gal working at the Apple Cellar here in Kalispell knows you and recommends we come meet you! Of special interest is your gardening expertise!!! Would you so us the honor of letting us come out?? Constance Chauvel-Gomez – who are you sending out your request of a visit to? We would be honored to visit any of the Colonies; we live in Kalispell, so believe Kingsbury, Pondera or West Kootenai are closest??? Does anyone know how I can contact the Amish in Ashland MT?? I know some people who purchased some horses from them and I would like to see if they have anymore available! Thank you! I am an outreach worker for a non-profit, primary and preventive health care clinic that provides services to all agricultural workers and their dependents at little or no cost. For decades, different religious communities have attended our walk-in clinic sites in Billings and around the state. Now that we have a clinic just south of Missoula, we are looking to reach out to those in St. Ignatius who are primarily employed in agriculture. Does anyone on this page have any ideas for how to reach out to ranchers and farmers in Lake County? Any stores or centers that would be a good place to leave information. If there are any ideas out there, I would be very interested! I wish to be fully involved in all asspects (beleifs) of a very traditional Amish family / community and hopefuly pray and work and live with an Amish family. There are no Amish here in Australia. It has been my desire to be Amish for many many years and finally I’m at a stage in life that I don’t want to just dream and talk , but accutally do somethinfg about joining!!! I am fully prepared to be an active member and intime be considered worthy. If there a no fully traditional Amish communites in Montana perhaps you can puy me in touch with one eslewhre in the USA / Canada. Pray and hope you can guide me in my future life in the Amish. we are in Montana in the period end of may 2015. I have read about the Amish a lot. I am very interested to learn your community better . We are passing the town of St Ignatius. I have a historic sheepherder wagon I am restoring to use as a guest room. I am in the need of a couple hoops to replace ones that are broken. I heard by word of mouth the Amish might be a good place to check and see if I could get a couple (3) made. I could get exact measurements but they are approximately 13 feet from one end of hoop to the other, 2.5 inches wide, 3/4 inches thick (I think). Can you help me with my quest to find some hoops and finish my “guest room”? Hi, Bret, here’s a start. 920-894-2198 Outside phone. Let it ring. No Sunday sales. Amish Wagons – Pennsylvania. This may have children’s toy wagons mixed with large horse wagons. you might also see if there is a Basque community around that could help with this. Basque did most of the sheep herding in the west such as Montana, Wyoming, etc. Are you close to one? There are some amish communities where it’s easier to join where they use more english, but you will just need to start searching once and see where it leads you. My family and I would like to learn about your community living. What guidelines you have? How you go about enforcing them? How do you purchase land; as a community or individuals? How do you problem solve? Do you trade services or use money? This is just a short list of things we’re curious about. It would be awesome to experience a community for a few months. I hope I will get the response in my email too. There are many books available for you to do research and get answers to some of your questions – I suggest you read “The Amish Way: Patient Faith in a Perilous World: by Kaybill, Nolt, Weaver, etal. Before you decide to try and join a community you need to be sure you can live their lifestyle (the main reason many ‘Englisher’ (non-Amish) do not stay … you must be able to live without electricity (no computer, no cell phone, no electronics at all) no cars, no running water, no forced air furnace or a/c unit, etc), so if you are not already living “off the grid” see if you can survive by just turning off the electricity and water service (hand haul your water in jugs) where you are currently living … how long can you go without??? If you didn’t have a vehicle could you walk to work every day?? If by chance you have already done this, and done your research, then you need to learn the Amish language – there are several free online sites where you will get basic instruction, but it is up to you to really learn and understand (i.e. USE the language yourself). After that, go and visit the different communities – each one is a bit different from the other. If you want to really be accepted by the Amish I would discourage you from just arriving at their doorstep and announcing that you want to be a new resident … you should find your own house (ask if something is available to rent … you may find something that needs some repairs), visit the Amish community store and businesses and introduce yourself once you find a place to rent, then the next step will be to find employment (many Amish men do work outside the community, and this is how they save money to purchase their own properties and horses/cows/etc). It is important for you to keep in mind that you must live like the Amish and travel like the Amish (no more cars! ), and be able to communicate with the Amish (their language) before the Amish will even consider being friendly enough to possibly invite you to attend one of their Sunday services (you don’t ask unless you know their language – the service is not in english). After being accepted by the Amish community (not as one of them mind you, but just accepted as you being yourself) you can volunteer to help with haying season or for general labor in the community garden (you must help to grow, harvest and put it up to be able to share in the crop … the more you do the more you get to share). As an outsider you will still be able to purchase items at the community store, and many times the dry food items may be purchased at a very low price (be sure to ask when their supply trucks arrive (such as Friday at 6am) and be sure to lend a hand with the other community members to unload the truck as many times it will be a semi truck full of boxes that must each be physically picked up and carried into the store). Should you consider coming to the Ashland area be sure to let us know – we take in single males and/or females, and in exchange for them assisting in the work at our ranch we will introduce you to the Ashland Amish community (much like a sponsorship) – you would begin as a non-paid apprentice, and then eventually move up if you decide to stick around. do the Montana Amish associate with the Montana Hutterites? I am 1/4 Hutterite from Central Washington state, and was aware the Hutterites were basically the “Amish of the West” living in Montana, the Dakotas, etc. I wasn’t aware until reading this article that there were any Amish communities as far west as Montana. Do the Hutterites and Amish associate with each other in Montana and other states where they both reside? I would assume so unless there had been some sort of falling-out. They both speak their own dialects of German, and of course there is English if the Hutterisch and PA Deutch dialects are too different to be easily mutually intelligible. Amish Community in Tongue River Valley , MT almost destroyed by proposed Railroad. by a proposed railroad line by the Tongue River Railroad. The proposed line would have run right through the middle of the community. The Coal Company whose coal would have been shipped on the line went bankrupt so the line is currently dead. I was just in the West Kootenai/Rexford community last week while visiting my sister in NW Montana. It was so beautiful! Unfortunately, there was a large fire just west of the community, and it looks like last night it spread east and affected some homes. Hope all are safe and praying for rain ASAP! Thanks for the note Andrea, I saw that news this morning. From what I read it was reported that the Amish are “OK”. Thanks for the reply and update, Erik! Keeping my fingers crossed that the fire line holds at bay and the winds blow in a favorable direction! It was extremely dry there– I can see how a fire could easily get out of control, as it is in much of the NW right now. I’m sure most other Amish communities don’t have the threat of wildfire that they do in Montana. I’d never visited the Rexford community before but was inspired to do so after inspiration from your website! Which, I must say, is some of the most interesting, informative, and pleasant reading on the internet these days! Now, if there were just an Amish community nearby to me in Alaska for me to visit– I’d be set! Wow Andrea, you made quite a journey if you came from Alaska…neat to hear you were able to visit. I’ve always thought it would be one of the most interesting communities to travel to. I hope you enjoyed the trip. Growing up in the east, wildfires were never on my radar, but must be a scary thing if you’re in the vicinity of one. Hopefully it gets under control soon. I am considering building s cabin on my property in the Miles City area, I was wondering if there is any Amish in the Forsyth MT area that would consider building this cabin for me. Hi, I’m writing a fictional book about the Rexford Montana Amish Community and I would love to get speak with someone who has been there and can tell me more about it. Thanks in advance for your help.